Do you still have any links for Fritz 15 and medicine ? Enjoy your instal play game tobe happy ,Attantion buy original for support Development ! is the German ISO. Is there any English ISO of Fritz-15 ? Pretty hard taking the champion ring from stockfish.. Page not found. Can you give me link of fritz 15 gui with key? Please help me. I want to dowload full version of FRITZ 15 . Medical mirror does not work !!! If you get a problem with this download for any reason you can try these. This is the set up files for the 32 and 64 bit Fritz 15 that you run to install it - choose whiever for your Windows Oprating System 32 or 64 bit. first time my fritz engine run but now i cant find my fritz 15 engine only uci work.how get back my real fritz 15 engine? i install deep fritz 14 too in my pc. cant run engine fritz 15 if i have fritz 14 or erase my fritz 15 uci?? rickystevano wrote: first time my fritz engine run but now i cant find my fritz 15 engine only uci work.how get back my real fritz 15 engine? i install deep fritz 14 too in my pc. cant run engine fritz 15 if i have fritz 14 or erase my fritz 15 uci?? The EXE file you should still have wherever you put it after download. so how i set back to real fritz 15 chess engine but not uci show when select engine? where is my fritz15.engine? Not sure I understand what you eman by "real" Fritz 15 engine - the engine you create using the EXE is the real one. If you want to change what shows in the list of engines to load then try going to ENGINE, then ENGINE MANAGEMENT, then you have ACTIVE and INACTIVE engines. Use the arrows to move things between the lists then do OK then you may need to restrt your Fritz. If you move everything except your "real" Fritz 15 to injactive then see what is left. i mean i cant find my fritz15.engine in folder chessbase/engine like fritz 14.. so when i select engine not fitz15 but only show uci fritz15 ,my fritz 15 not show in select engine? how to put my fritz15 to select engine? 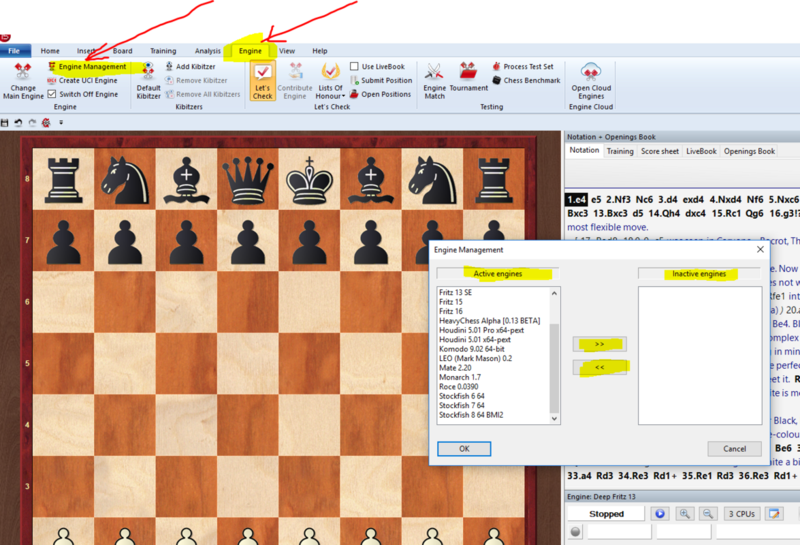 rickystevano wrote: i mean i cant find my fritz15.engine in folder chessbase/engine like fritz 14.. so when i select engine not fitz15 but only show uci fritz15 ,my fritz 15 not show in select engine? how to put my fritz15 to select engine? yes its uci fritz 15 but folder engine not any fritz 15 i put from my (fritz15.exe) engine.uci to engine? You keep saying you need your "real" F15 engine not uci - but the F15 engine IS a uci engine. So just re-create it again using the F15 EXE you can download. Create the engine again - it will be the "real" engine - there is not a F15 engine that is NOT uci - its not like the older Fritz engines (13 etc) that were native chessbase engines - now Fritz 15 is a UCI engine. So it should be in the folder engine.uci. first time i instal its fritz15 when select game but suddenly to be uci because i have uci firitz15 too in my pc.so where is my fritz 15.exe real? how create it to real? i download from here its keep uci too. i reinstall my fritz 15 it keep uci too? erase my fritz15 uci folder? rickystevano wrote: first time i instal its fritz15 when select game but suddenly to be uci because i have uci firitz15 too in my pc.so where is my fritz 15.exe real? how create it to real? i download from here its keep uci too. i reinstall my fritz 15 it keep uci too? erase my fritz15 uci folder? That is also where the uci engines are.